A ratchet spanner is used to tighten and loosen nuts and bolts. The ratchet mechanism lets it exert undo the nut only in one direction - meaning that you can quickly undo or tighten nuts without having to constantly lift the ratchet off, as you would with a traditional spanner. 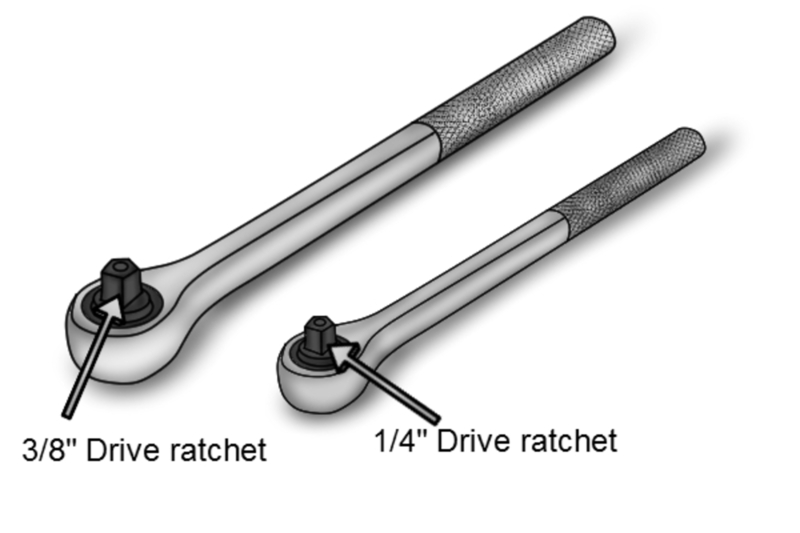 All ratchets accept sockets using a square drive and mostly there are three sizes of drive. Everywhere in the world these sizes are given in inches - even when the sockets are metric. 1/4 inch - Used for smaller sockets and precision work. Useful for dismantling individual components on the bench. 1/2 inch - 1/2" sockets are generally used for nuts and bolts from around 10mm and up. A 1/2" drive socket can apply enough force to undo all nuts on a car. There are also 3/4" and 1" ratchets but these are used on trucks, tanks and industrial machinery. Inside a ratchet there is a toothed wheel which lets it freely rotate as you tighten the nut. Each click you hear is a tooth passing the ratchet. The more teeth there are, the less movement is needed on the return stroke. A ratchet with 75 teeth will work considerably faster than a 32-tooth ratchet. Making high tooth-counts requires quality engineering and manufacturing, so as a general guide the better quality tools will have a higher tooth count. Sockets are held onto the ratchet using a little spring-loaded ball on the side of the square drive. After applying a lot of force, I've often found sockets get stuck on the drive and the only way to get them off is to hammer the ratchet on the floor or even grip it in a vice. Good quality ratchets include a button on the back which smoothly pushes off the socket when you are ready to release it. More than any other tool, a ratchet will last you a lifetime. Quality ratchets can be serviced inexpensively and so should never wear out. Sockets are interchangeable because they are all standard. Buy the best ratchet you can afford, even if you buy inexpensive sockets to start with. My go-to ratchet was made in the 1960s and inherited from a family friend. I still use it every day.